We all know that cleaning can be so much work! 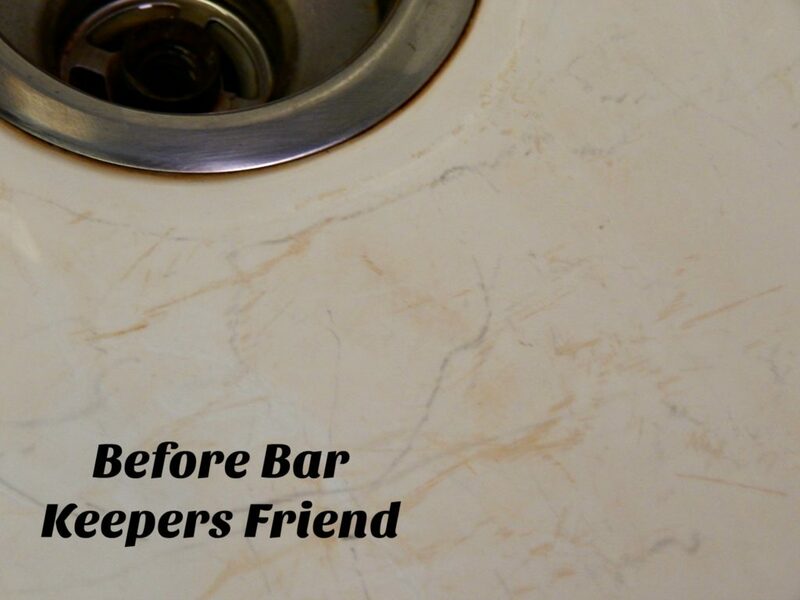 Bar Keepers Friend Cleaner can make your life so much easier. Plus, you will have a friend for life! We were getting ready to remodel our 70’s style kitchen a couple of years ago and my husband wanted a porcelain sink. Almost every home we have lived in previously had a porcelain sink and I hated them all! They would get black and gray marks, rust marks and they just never looked clean. I would bleach them to no end and never could get them to look white. 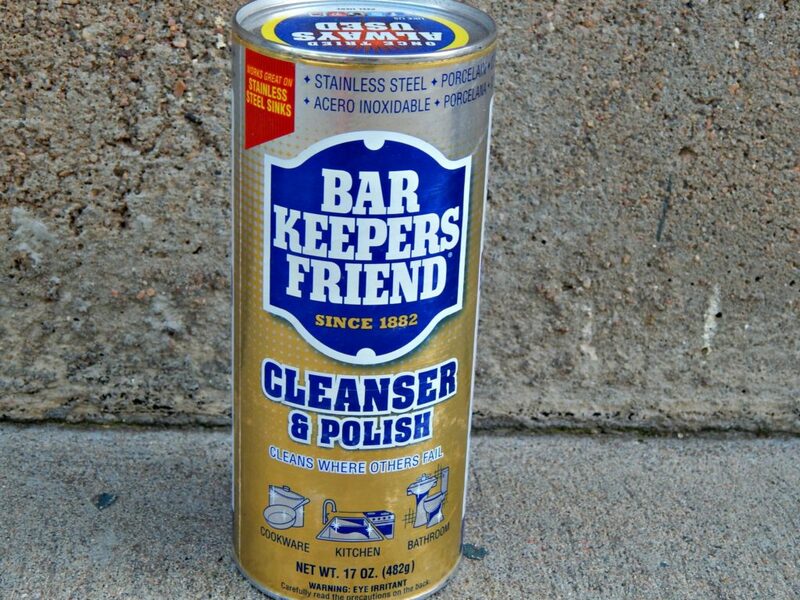 Then one day I was introduced to Bar Keepers Friend Cleaner and I fell in love! You can use this stuff on so many things and it cuts grease and other unsightly stains like no other. Imagine cleaning your pots and pans and have them so clean they look new again. It works! Clean your bathtub, your porcelain sink, your stainless steel sink and even your glass top stove. I am sure there are many other things you can use it on as well, those are just the way I use it. As you can see from the photo above, my sink gets pretty messed up! Lots of rusty stains and those awful black marks. Yuck! These types of stains absolutely drive me crazy. If you ask my husband he will say that’s not hard to do! To use Bar Keepers Friend Cleaner just wet the area down and sprinkle the powder on what you want to clean. They do make a liquid cleaner as well, but I am not as big of a fan. I prefer the powder cleaner so much more. Anyway, once you sprinkle it on you can start scrubbing lightly with a sponge. I prefer the Scotch Brite Sponges for all of my cleaning. Then you just rinse it off. It’s that easy! For stubborn stains you can clean it several times until the stain is gone. You can see the difference in these photos. After using the Bar Keepers Friend Cleaner it is like night and day difference. Another way I use it is on my glass top stove. You know how you get that dark ring around the burners? Well, I just use the cleaner the same way and scrub it off with a sponge. It is like magic! This cleaner is inexpensive, so it won’t break the bank and it takes the headache out of cleaning. It’s important to note if you clean something like a stove, make sure you get all the cleaner off pretty quickly. It can damage the paint finish and you certainly don’t want that. 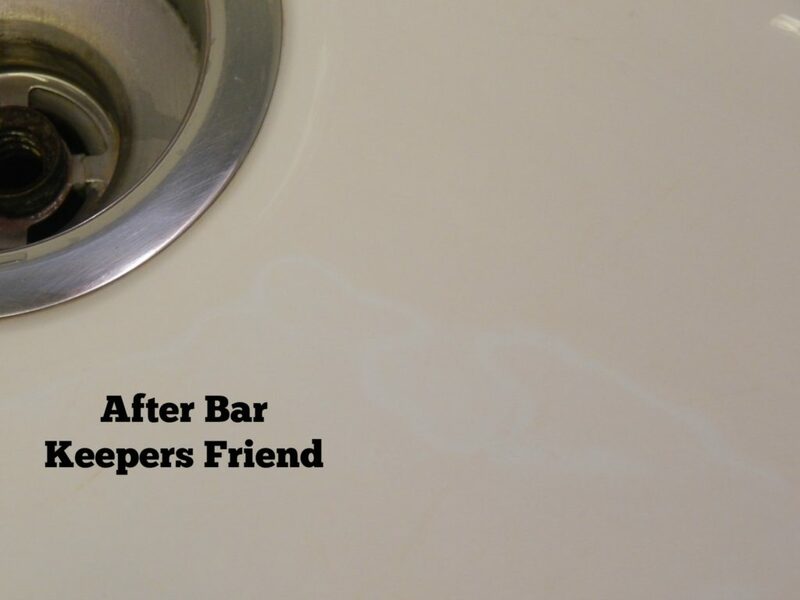 Hope you can get some enjoyment out of Bar Keepers Friend Cleaner the way I have!